This year’s garden was an amazing success, in spite of the drought and the usual insects and critters. The soil has been improved over the years, partly due to the decay of the mulches we have put onto it. However, perhaps the biggest factor this year was a consultation with a soil enhancement specialist and the addition of both spring and fall mineral supplements. In doing the yearly garden bookkeeping, the garden has more than paid for itself in the vegetables and flowers it has produced. Everything was weighed or counted between harvest and the kitchen. Most impressive was the count of over 6,000 cherry tomatoes and 525 lbs of blue pumpkin, along with 200 lbs of other winter squash. We should have enough squash to feed people all through next summer. Garlic, beets, potatoes, onions, and frozen tomatoes will last us into the spring. It is so gratifying to see so many things from the garden on our lunch table, freshly picked and delicious. We have been fortunate to have the help of several volunteers. With their assistance, we are making a great deal of compost and have moved more than 12 cu. yds. of enriched aged cow and horse manure into the beds. New beds have been dug along the outside of the fence, and these will mostly be used for onions and garlic, which the critters do not eat. They may even provide a repellent of sorts. Crops will be rotated in the beds inside the garden. Several are still supplying us with greens, well into November. A bench has been placed under an arbor facing Kwan Yin, and many yogis have spent a quiet, contemplative time there. Beautiful blue morning glories grew up around her this past season. 15 rose bushes were planted, mostly in the garden but a few in other beds on the property. A growing assortment of gorgeous dahlias was in the bed by the garden shed. The bulbs have been dug and saved for next year’s planting. Hundreds of zinnias bloomed, and all of these flowers graced the alter and the farmhouse. Each year there are a few experiments. This year, none of them proved very popular. A spinach substitute grew prolifically, but its taste and texture were poor. Our one sweet potato vine produced only four small potatoes. Our new potato variety did not produce well, though that may be due to the drought and bugs. 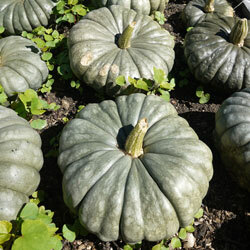 The green pumpkins, while hardy and prolific, are difficult to process. It’s hard to even get a knife into the flesh, it is so dense. However, we have found means, and guests will be eating soup and pies and roasted squash this winter. Currently in the R&D phase are pumpkin brownies, pumpkin cookies, and pumpkin bread. The garden has been enjoyed by so many people, and we have received wonderful feedback, which is always important. We have also received good gardening advice and recipes. It is an ongoing learning opportunity. It is gratifying to watch the guests do walking meditation both in and around the garden, and to see them sitting quietly with Kwan Yin. It is a joy to work in, and especially to harvest and bring into the kitchen. As the garden goes to sleep for the winter, already we are dreaming of next year and beginning to make preparations.